One of the best episodes of The West Wing is “The Crackpots and These Women,” which introduced “Big Block of Cheese Day” to the American political lexicon. On this day, all of the wackiest groups that usually wouldn’t get a meeting with White House staff are invited in to air their crackpot ideas – highways for wolves, UFOs, etc. For the last half-century, the basic income – a guaranteed minimum amount of money for every adult citizen – has been one such crackpot idea. That is, until its recent renaissance. Outlets from Reason to Rolling Stone have written think pieces extolling the virtues of a basic income, and it isn’t hard to see why; The Great Recession has thrown the shortcomings of our economic system into sharp relief. Wages have stagnated while productivity has risen. Income inequality – to say nothing of vast disparities in wealth – has skyrocketed, while the cost of higher education, the new ticket into the middle class, steadily climbs higher. Today, college graduates compete with less-educated workers for low-wage jobs in a depressing race to the bottom. It is no wonder that the idea of a guaranteed minimum income has gained traction. Progressives often see the basic income as a Trojan horse devised by conservatives to dismantle the welfare state and replace it with something far more inadequate. But a guaranteed basic income would improve individual welfare, enhance individual freedom, and promote individual dignity. It is certainly the program the poor would design for themselves. Even better, by expanding the constituency of the current welfare system to every adult American, the basic income would be far more immune to the death by a thousand cuts that threatens contemporary programs. Despite the endless arguments in the political arena over the causes of poverty, it should be obvious that the true cause is a lack of money. Yes, there are structural and individual factors that keep people poor, but I don’t think it’s controversial to say that giving a poor person a pile of money makes them no longer poor. Yet, for a host of reasons, conservatives and progressives are content to continue the same inefficient anti-poverty programs and argue over the level of funding rather than just sending folks a check. Take, for instance, the SNAP program, which distributes food stamps to millions of low-income families each month. In 2006, according to a Brookings Institution study, the program cost $35.8 billion, with $4.8 to 5.7 billion of the total going to administrative costs – determining eligibility, distributing and tracking benefits, preventing fraud, training staff, etc. For every dollar of food stamps issued, state and federal governments spent 15.8 cents administering the program. This doesn’t count the costs incurred by low-income families themselves, who rarely have extra time or money to spend, filling out lengthy application forms, attending in-person interviews, providing documentation and jumping through the various hoops required to get food stamps. Unsurprisingly, the program had a participation rate of 65 percent of eligible individuals. These costs totally outpace what most Americans think is the most expensive factor in anti-poverty programs, fraud and waste. A Department of Agriculture report found that the rate of food stamp fraud – people illegally exchanging benefits for cash – was 1.3 cents for every food stamp dollar issued between 2009 and 2011. And that is only one of the 126 federal anti-poverty programs. The SNAP example, which I’ve written about previously, illustrates the folly of designing public policy to achieve certain outcomes for individuals, and then entrusting implementation to bureaucracies. One need not believe in the myth of homo economicus, the rational and ever-maximizing avatar from your Econ 101 textbook, to understand why substituting the judgment of a civil servant for that of any citizen in private affairs is inherently inefficient. For one, even the smartest and most dedicated government official, working 9 to 5, is unlikely to spend as much time thinking about how much some random guy should spend on groceries as the aforementioned random guy will. Furthermore, giving that random guy more grocery money than he wants does not stop him from trading his benefits for something he does want – it just makes it harder and forces the government to spend money attempting to stop him. If we would just let people make their own choices with the resources we believe they need to survive, we could save everyone a lot of grief in the process. to live under robber barons than under omnipotent moral busybodies. The robber baron’s cruelty may sometimes sleep, his cupidity may at some point be satiated; but those who torment us for our own good will torment us without end for they do so with the approval of their own conscience. The fact that we continue to insist on work requirements for welfare, or in-kind assistance rather than cash assistance, speaks volumes about our attitudes toward the poor. There is a pernicious belief in our society that the poor are incapable of making good choices for themselves, which is why they need assistance in the first place. It’s the same dim view of our fellow citizens which drives some opposition to the basic income – namely, that people would stop working en masse and become layabouts if we insured that no one had to live below the poverty level. This is a preposterous argument, if only because most people are not content to be bored and sit around hovering just above poverty all day. But it also misses an important point – namely, that government programs are a poor mechanism for social engineering. Poverty does not create sloth. There will always be lazy people, scheming people, generally unpleasant people – we cannot legislate or plan them out of existence. Instead of designing policies for the lowest common denominator, we should create policies that affirm the dignity of individual choice, regardless of social status. The basic income would do this. Sadly, while populist outrage over the misdeeds of corporations and the elites has risen in recent years, there is still little enthusiasm for addressing income inequality through measures that smack of wealth redistribution. This is one reason that anti-poverty programs remain widely unpopular – the perception that the government is taking from “us” to give to “them” – insert your preferred scapegoat, slur or epithet. It is no secret that racialized views of poverty contribute to the enduring unpopularity of programs designed to lift people out of poverty. 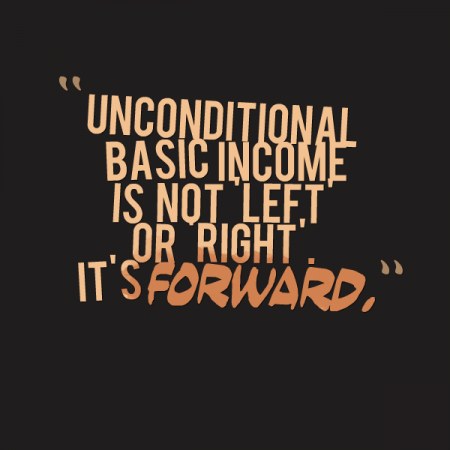 For progressives, the basic income offers the best hope for lifting the anti-poverty debate out of this toxic arena and broadening the constituency for anti-poverty programs beyond the poor to include everyone else. The ironclad portions of the federal budget – Medicare, Social Security, military spending – are protected precisely because the many have a stake, rather than the few. A guaranteed minimum income for every adult – essentially, a new entitlement for every American – would be a bulwark against future funding cuts. At the end of the day, while the basic income would most benefit those living at the margins of our society, it would also give those of us working jobs we hate to ensure our survival the freedom to find something more meaningful – more entrepreneurial, perhaps, or just more fulfilling. It would free us from the necessity of having to struggle for the basics, making our society happier, healthier and more democratic. Perhaps the basic income is still just another crackpot theory – but a guy can dream. Reblogged this on "What If…? ".